Making this stylish crochet tote is as easy as stitching square motifs. 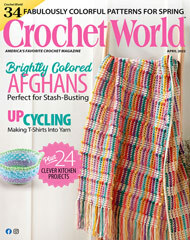 This crochet handbag pattern was originally published in the August 2010 issue of Crochet World magazine. Size: 13" x 13", plus insert panel. Crochet handbag made with medium (worsted) weight yarn and size F (3.75mm) hook.